Kids will have so much fun with this alphabet game. 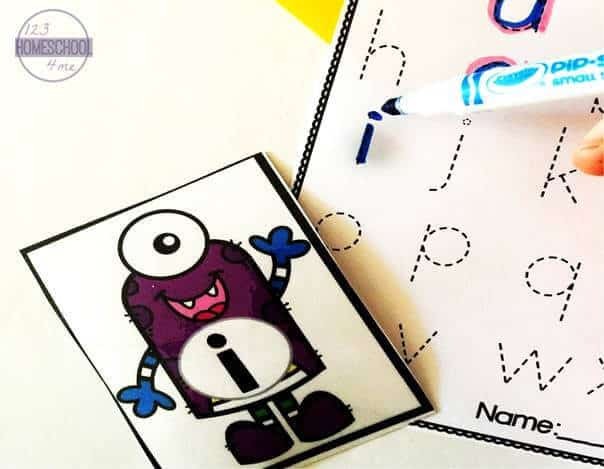 Kids will choose a monster alphabet cards and then reinforce lowercase letters as they practice alphabet tracing with this fun and effective Monster Alphabet Find and Trace. 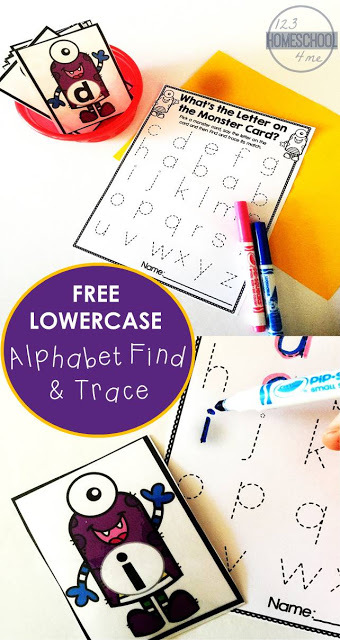 Work on identifying lowercase letters with this Monster Alphabet Tracing. Students choose a card, say the letter name and find its match on their recording sheet. The kids will be working on identifying their letters and forming their letters in one activity! This works great for kids who are struggling with identifying their letters like ELL / ESL kids. The monster themed cards will spike the child’s interest as they pick a card and say the letter name. The kids to rainbow trace their letters, use crayons, markers or coloring pencils. To make this a versatile and re-usable activity, you can also choose to laminate the recording sheet and have the kids use dry erase markers on the sheet as they work on their letter identification and formation skills. 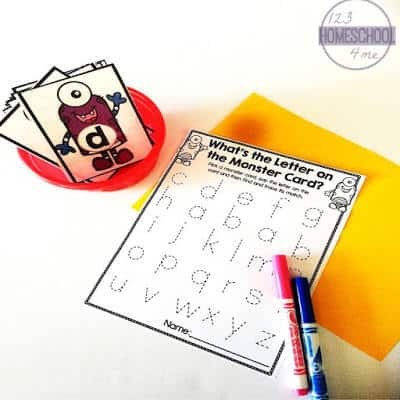 Download the Alphabet Monster Lowercase Letter Cards below. Note: you can laminate the recording sheet if you wish to be re-using it. Stack the Monster Alphabet Cards in the middle of the table. Hand out a recording sheet to each student in the group. Explain that they are to choose one card at a time. They say the letter on the card and then find it on their recording sheet. They then rainbow trace (or use markers, scented markers, colored pencils, highlighters and more) the letters on their recording sheet. They repeat this process until they’ve colored or traced all the letters on their sheet!